There are several applications, platforms and integrations that allow you, as a retailer, to market to your target audiences by segmenting them based on purchase history, browsing behavior, or demographics. Once you have identified your various target audiences, segmentation is an easy way to appeal to them on a personal level in such a way that encourages a purchase. Marketers have been using this method for years and have seen great success. Like I’ve mentioned in my previous blog posts, transactional emails are a missed opportunity and this includes segmentation. Although it is very common to see marketing emails segmented by customer information, you rarely see this with transactional emails. This is because a system must gather information about a customer and apply the segmentation prior to an order confirmation email being sent. We believe all emails should have segmentation applied to them. In my previous blog post, I discussed how some real order confirmations could be improved upon. Let’s revisit the Kate Spade example. 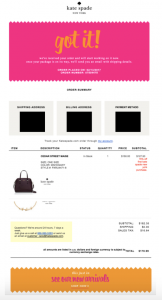 In this example we see that the customer purchased a bag and a bracelet, both from the sale section, and they used a 15% off coupon. This is a customer that appreciates fine goods but is looking for a great deal. That being said, it doesn’t make much sense to market “new arrivals” to them in the promotional space beneath the order information. They may click through and browse the New Arrivals, but ultimately are unlikely to make a full priced purchase. If this email had been segmented by customers that purchased from the sale category, or by customers who used a coupon, it could include messaging related to their buying pattern. Perhaps the promotional section could lead them to a “last chance” page, which would help move out inventory from a previous season, or offer a 10% off code for their next purchase to encourage a second purchase. By segmenting transactional emails, you have the chance to not just direct your customers back to your store, but help them find a category or product page that will most likely result in a purchase. Although knowing what other customers purchase is helpful and interesting, it may not be the best way to market to certain segments of your customer base. In the fast fashion space, for example, people are looking to buy inexpensive trendy items and are often looking for an outfit for a specific event, like a music festival. These customers would rather understand how to put an outfit together and see what other pieces would complete their look. Check back soon for more on improving your transactional emails! Shopify and MailChimp are breaking up. Now what?